No-bake oatmeal cookies with peanut butter, cocoa, raisins, nuts and coconut. 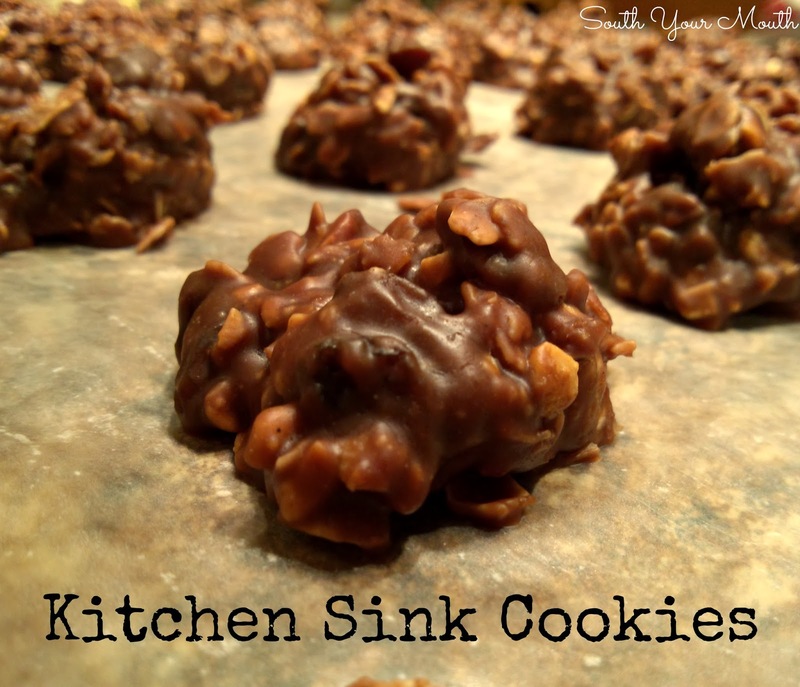 I love, love, LOVE me some no-bake cookies. For lots of reasons too. I love that I don’t have to turn on my oven to make these. No, seriously, I LOVE that. It gets like 437 degrees here in the summer. That’s a huge selling point for me. I love that there’s no flour in these and that you use whole grain oats instead. I won’t sit here and try to tell you they’re healthy (there’s like a wagon load of sugar in these) but whole grains over white flour is a win in my book any day. I love that I don’t have to make these in batches to get them done. Once I mix them up, I just scoopscoopscoopscoop until they’re all portioned out and I’m done. No waiting 10-12 minutes per batch of cookies in the oven ten times until they’re all done. Just scoopscoopscoopscoop and done. And peanut butter?! Peanut butter is like kiddo super food. Come and have some protein-I-mean-cookies kids! I’m always experimenting with these and this time, I think I found my favorite. I’m going to call these Kitchen Sink Cookies because, I put a little bit of everything in these babies! You get it, right? Everything but the kitchen sink? OK, just had to check! The best part? The onions had no idea there were raisins in these! NO CLUE! I love chocolate and raisins together. And the crunchy nuts with the chewy raisins and coconut give you an amazing texture combination! Add peanut butter and vanilla; stir well. Add oatmeal, raisins, nuts and coconut and stir until thoroughly incorporated. On a sheet of waxed paper, drop mixture by rounded teaspoonfuls (I use a cookie scoop). Cool several hours until set and firm. Whatever do you mean? It clearly states to add it after the nuts. HA! Kidding! I totally skipped it when I typed out the recipe! I just added it to the directions. I'm so glad you asked! Love your recipes. I've been making a version of this for ... well, a southern lady won't say how many years. Here's my trick. Instead of dropping mixture on waxed paper, spread it in a lightly sprayed dish and let the mixture set until firm. Slice like fudge. Delicious! you can add pretzels instead of nuts too if your kids dont like or are allergic to them! I see no reason why you can't cut the sugar in this recipe. Am I missing something? I bet ya it tastes just fine with ONE cup, instead of 2. If it changes the texture, add more oatmeal until it holds together. When I was a kid, my mother had survived the depression and food rationing during WW2, so by the time we came along in the 1950s she was still in the habit of rationing. We didn't like cookies made with more than half the sugar, because, face it, people get carried away with sugar. I still cut the sugar in recipes.